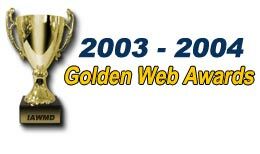 The South Hamilton website wins a 2003-2004 Golden Web Award. the South Hamilton Computer Club Some South Hamilton students found they could easily help the school and their website by learning to make their own pages. They practiced their skills by placing photos of themselves and their friends on a page or two (or many more). Thanks to the above students who helped the South Hamilton School website win a Golden Web Award. These students are some of South Hamilton's Treasures, the Golden Girls. Thanks, girls!